I have told my students and mentoring clients that they are going to get a great lesson in the trading relevance of Dow Theory and technical analysis in the very near future. For the last 10 trading days (two calendar weeks) the Dow Industrials have been trapped in a tight trading range. In Dow Theory parlance this is called a “line”. The longer this line progresses the more technically significant the breakout trend will be for savvy traders to exploit. At the moment the Dow Transport Index is in bullish “breakout” mode and is in disagreement with the Industrials. Thus we have a classic situation of Dow Divergence. This signifies that there is significant uncertainty in the market place and with it corresponding increased risk. How this will play out is anybody’s guess. Will the nifty Transports win the day and save the Industrials or will the superior valuation weight of the Industrials over power the Transports? Currently I am on the sidelines waiting for the market to tell me its secrets. I don’t think we will have much longer to wait. I am a fan of Janet Yellen. In a way I am sorry that she has inherited such an incredibly complex FED driven situation from Ben Bernanke. It has yet to be seen how she can balance QE tapering, interest rate inflation, stock market “hyperbolia” and real estate trancing. I do wish her the very best. In my view the jury is still out as to what will be the true market reaction to QE tapering. 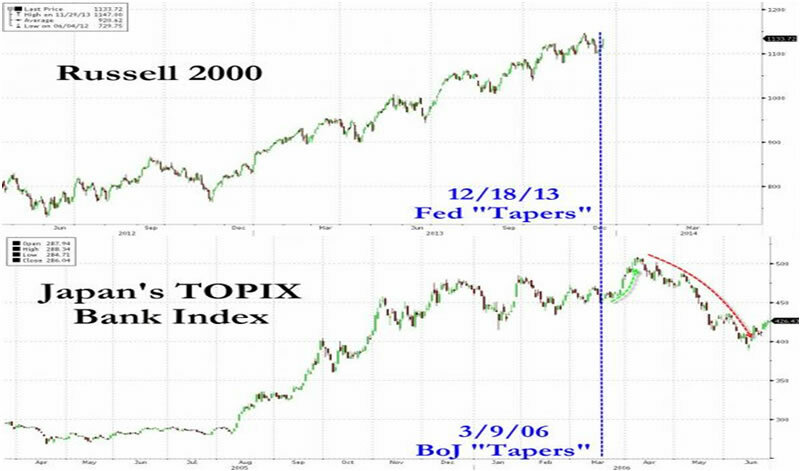 Just before Christmas a fascinating little item appeared on Zero Hedge outlining in graphic format what happened when Japan unwound tapering in 2006. I think it gives great food for thought as we await the Dow Theory jury to decide the markets 2014 fate. “After having followed a zero interest rate policy strategy and facing a further deteriorating economy in an environment of falling prices (deflation), the Bank of Japan (BoJ) announced the introduction of QE on 19 March 2001 and kept it in place until 9 March 2006. The BoJ chose for a very orderly and gradual unwinding of its government securities portfolio, by continuing its regular purchases of these securities (i.e. a taper and not sale). The market rejoiced at the normalization for a week or 2... before dropping 24% in the following 2 months. I hope equity markets in America in no way mirror this Japanese scenario. Something tells me 2014 is going to be a very very interesting year. realize that the economy in Europe is in reality a total basket case. This crisis is not being adequately reported in the mainstream media. Why I do not know. For example, yesterday in Dublin I had to get a watch repaired for my daughter. To get to the shop where the gift was purchased I needed to go to a part of the city I had not been to for many years. When I arrived at the city centre I was shocked. On this “busy” street shop after shop was closed or in the process of closing down. I asked a trader what was going on. He said that property tax rate hikes, the online shopping paradigm shift and collapsing street footfall were making it impossible to make retail ends meet. He pointed out that this was not only happening in Dublin. He showed me specialist retail newsletters which highlighted the fact that in towns all over Ireland retail “drags” were becoming ghost malls. Whole main streets were being boarded up and falling into dis-repair. Retail Ireland, he said, “was in collapse”. This situation is not only an Irish experience. It is being felt throughout all of Europe. I believe it is important that this truth reach common consciousness. Then perhaps the disaster that is current Euro policy may be modified and allow the adoption of policies that nurture true business development with concomitant employment growth. Without this Europe faces a grim future. “If you are anxiously awaiting the arrival of the "economic collapse", just open up your eyes and look at what is actually happening in Europe. The entire continent is a giant economic mess right now. Unemployment and poverty levels are setting record highs, car sales are setting record lows, and there is an ocean of bad loans and red ink everywhere you look. Over the past several years, most of the attention has been on the economic struggles of Greece, Spain and Portugal and without a doubt things continue to get even worse in those nations. 1. The unemployment rate in the eurozone as a whole is still sitting at an all-time record high of 12.1 percent. 2. It Italy, the unemployment rate has soared to a brand new all-time record high of 12.7 percent. 3. The youth unemployment rate in Italy has jumped up to 41.6 percent. 4. The level of poverty in Italy is now the highest that has ever been recorded. 5. Many analysts expect major economic trouble in Italy over the next couple of years. The President of Italy is openly warning of "widespread social tension and unrest" in his nation in 2014. 6. Citigroup is projecting that Italy's debt to GDP ratio will surpass 140 percent by the year 2016. 7. Citigroup is projecting that Greece's debt to GDP ratio will surpass 200 percent by the year 2016. 8. Citigroup is projecting that the unemployment rate in Greece will reach 32 percent in 2015. 9. The unemployment rate in Spain is still sitting at an all-time record high of 26.7 percent. 10. The youth unemployment rate in Spain is now up to 57.7 percent - even higher than in Greece. 11. The percentage of bad loans in Spain has risen for eight straight months and recently hit a brand new all-time record high of 13 percent. 12. The number of mortgage applications in Spain has fallen by 90 percent since the peak of the housing boom. 13. The unemployment rate in France has risen for 9 quarters in a row and recently soared to a new 16 year high. 14. For 2013, car sales in Europe were on pace to hit the lowest yearly level ever recorded. 15. 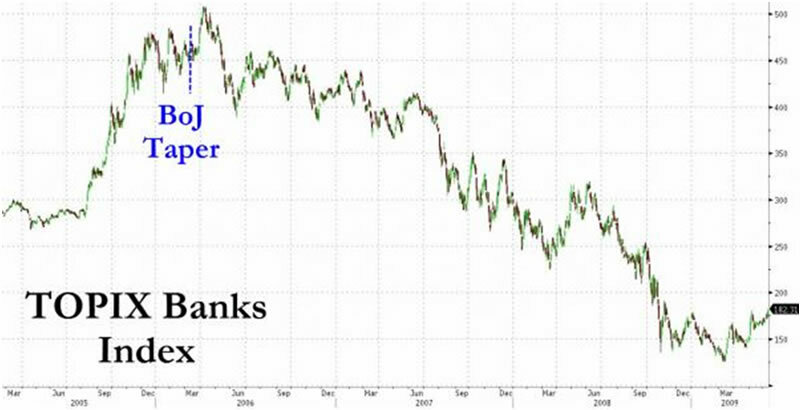 Deutsche Bank, probably the most important bank in Germany, is the most highly leveraged bank in Europe (60 to 1) and it has approximately 70 trillion dollars worth of exposure to derivatives. 16. It would be hard to put into words the extreme desperation that unemployed workers throughout Europe are feeling right now. When you can't feed your family and you can't find work no matter how hard you try, it can be absolutely soul crushing. “Having trouble wrapping your head around southern Europe's staggering unemployment problem? Look no further than a single Ikea furniture store manager’s experience on Spain's Mediterranean coast. Upon planning to open a new megastore next summer near Valencia Ikea's started taking applications for 400 jobs at the location. The company wasn't prepared for what came next. Thus my fervent New Year Irish wish is that throughout Europe truth begins to be reported rather than agenda driven propaganda.